Today we’ll be talking about situations where we will use agents, where we won’t, and why or why not. Let’s talk about syslog in general. When you setup a device to send its log entries to a logging server… what happens? Well, good question! Many things could happen. Depending on the device type and implementation of its syslog mechanism it could mean that all entries that are logged are no longer stored on the device and are solely shipped to the logging server. Or, it could mean that every single entry anywhere in /var/log/ is sent to the syslog server and also retained locally (possibly growing /var/log out of control). Maybe something gets appended to the beginning or end of each log entry. Maybe nothing gets appended and all you have is the IP address of the device as an identifier. Sometimes you can configure this behavior with packages like rsyslog. Either way, when you send logs via syslog you are requiring the native log shipping mechanisms to do their thing and hoping that the output is useful and structured. Both examples of these logs above are taken from the Administration | Hosts menu within LogInsight. In both cases it looks like single-line logs were shipped and things entered cleanly. However, this is not always the case. This is where you’ll find all of your ordinary syslog “hosts” stored. Because these are syslog events, you might be lucky and get an actual hostname or you might just get an IP address for the “host”. But, either way, things that show up here need to have a set of rules built around them (which VMware does provide via various Content Packs/Dashboards) in order to make use of the actual information. Or, you could just use LogInsight to store syslogs for longer duration than could an endpoint, but you probably want to leverage other vRealize LogInsight clever features. 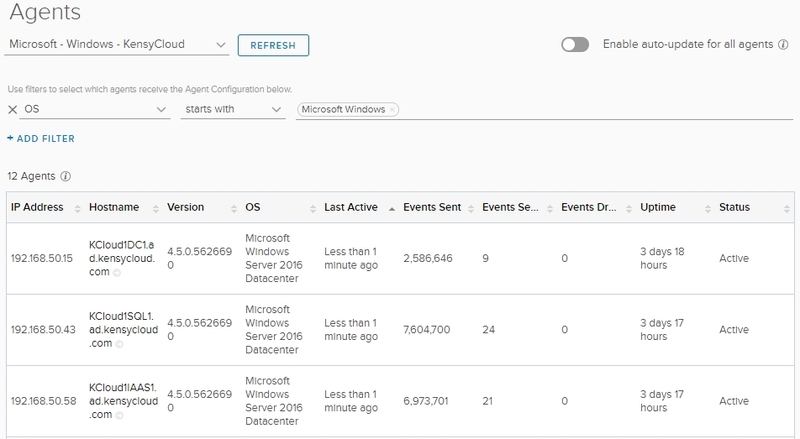 Enter the vRealize LogInsight Agent. 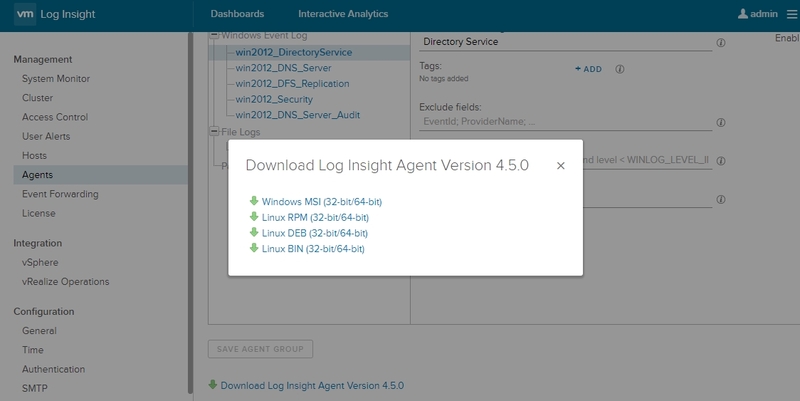 What is a vRealize LogInsight agent? Leverages the vRealize LogInsight ingestion API for compression, encryption, and more. You can see I cloned the Microsoft – Windows Content Pack group to “Microsoft – Windows – KensyCloud” so as to not lose the original configuration. When you installed the Microsoft – Windows Content Pack you would have seen the instructions on what needs to be performed from within the guest in order to get the right data out. In case you missed it, or ignored it, you can review the information by going to Content Pack admin menu and selecting the installed pack, then clicking the cog near the top of the screen and choosing Setup Instructions. Some Content Packs do not require anything to be performed in the guest. That’s it! Of course you can tweak the dashboards and or view the actual source syslog messages, but you get the idea. The benefit of the agent is that you can collect a lot more than syslog might be able to send by default. For instance, Microsoft – SQL Server Content Pack extracts fields out from the SQL Server logging location (default is C:\Program Files\Microsoft SQL Server\MSSQL10.MSSQLSERVER\MSSQL\Log). The cool thing is that this does not mess with the actual log file for SQL Server. 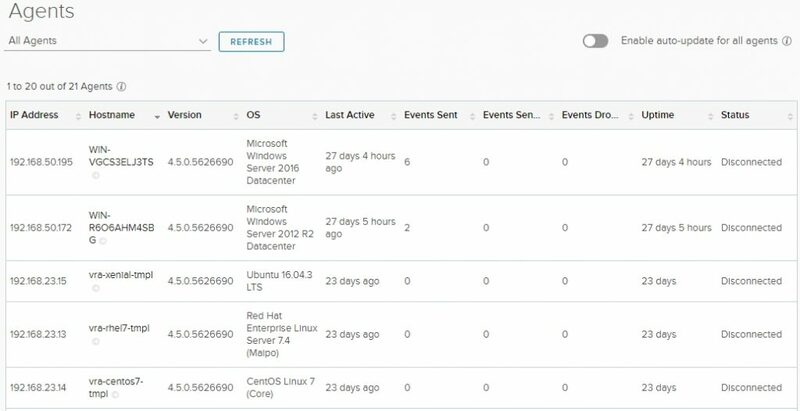 Instead, there is an operational log kept by the vRealize LogInsight agent itself (default is C:\ProgramData\VMware\Log Insight Agent\logs) which rolls over every 10MB with a total combined 50MB total aggregated capacity across LogInsight agent logs. So, you can see how this might be super useful for building your own fields and dashboards for applications you run. Another benefit is appeasing your security guy(s). For instance, some NetSec people shudder when you say you’re shipping syslogs inside or outside of a network via UDP/TCP 514 – “OMG – there could be credentials in plaintext!” They’re not wrong. Sure, there’s encrypted syslog but if you want to ensure encryption (and compression) is in place simply use the cfapi with ssl method for connection to the LogInsight server within the agent config (this is the default) and REST easy (I love puns). 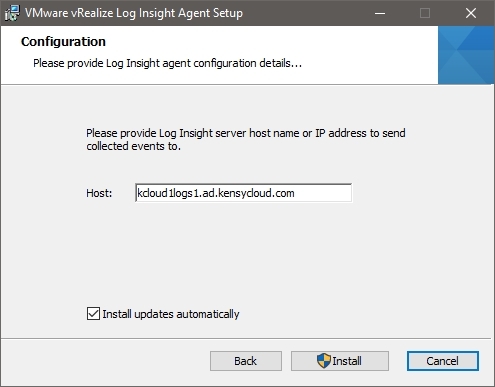 ; VMware Log Insight Agent configuration. Please save as UTF-8 if you use non-ASCII names / values ! ; Note: It may be more efficient to configure from server's Agents page ! ; Time in minutes to force reconnection to the server. ; Logging verbosity: 0 (no debug messages), 1 (essentials), 2 (verbose with more impact on performance). ; Max local storage usage limit (data + logs) in MBs. Valid range: 100-2000 MB. ; if available will automatically download and apply the update. If you want to change any of the default options you can do so. Both the Windows and Linux agents run as a service/daemon. There are many installation customization options available so be sure to check the documentation for all options available. One other really neat feature of deploying the vRealize LogInsight agent is that you can do it via GPO for Windows as well. This relies on the creation of a .mst transformation file along with the .msi installer file and the options within the transform file are applied to the Windows OS receiving the GPO. I encourage you to check out the documentation on this as it’s a little more complex than I think is worth getting into for this blog entry but you can probably see how powerful this might be. Put an AD Computer Object into an OU, GPO applies, boom logs come in via agent. You get it. You can see I have a bunch of stuff that checked in 20 – 30 days ago when I patched the templates. However, once the machine is deployed and has a unique hostname everything reports correctly. 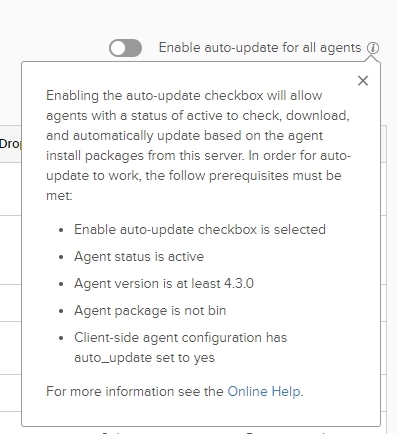 By sliding the toggle to “on” all agents will be upgraded in the future to the version of the agent being served up by your vRealize LogInsight server. Pretty neat, right? Hopefully this part of my LogInsight series has helped you understand the benefit of using the vRealize LogInsight agent while also showing you brief examples of what you can do with and without the agent. Let me know if you have any other tips or tricks! Thanks all! 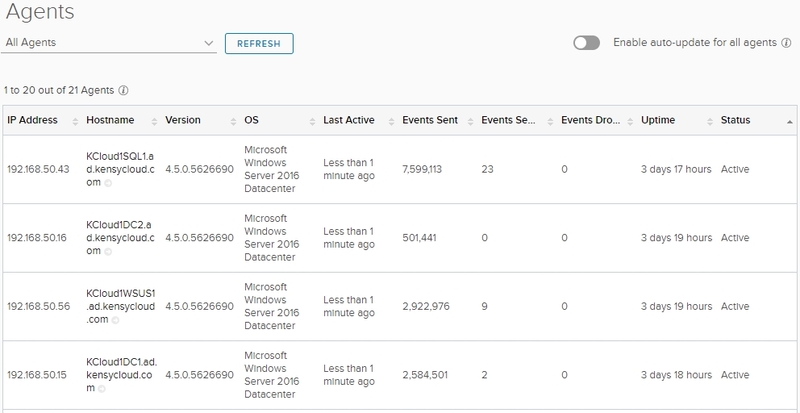 hi, I have done everything but nothing will appear on vmware log insight from windows. I’ve checked logs and everything seems find and connection established, but I see nothing in console and no agent forwarded events, plz help. i was facing the same issue , i did changes in loginsight.ini and uncommented few values, entered the port:9543 and it worked.